This cute, little ring with a cute picture of The Trifid Nebula in Stars and Dust. 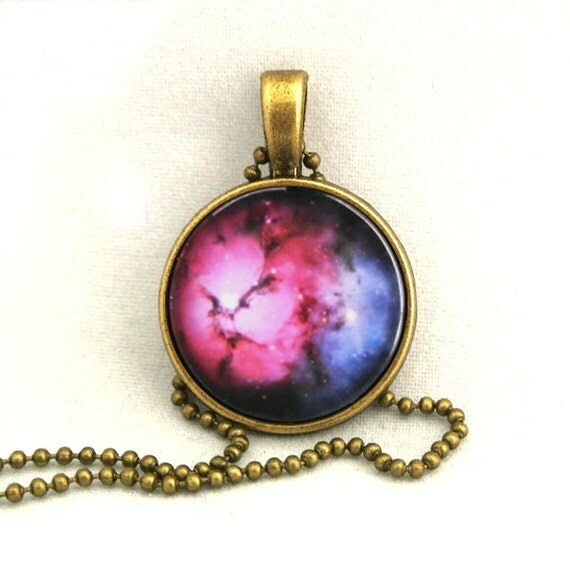 This nebula necklace features the beautiful Nebula Trifid, which is a cosmic study in colorful contrasts. Also known as M20, it lies about 5,000 light-years away toward the nebula rich constellation Sagittarius. It is a star forming region in the plane of our galaxy, and is about 40 light-years across. The pendant measures approximately 2.cm x 2cm. and the silver plated chain measures 50cm(18 inch) by default, but can be lengthen without extra charge. Will come shipped gift wrapped with in three days of payment. 10 SALE Ring Little Pink Background with White by timegemstone. This cute, little ring with pink heart pattern.